Your favorite fast foods, just slightly healthier. Sometimes fast food is inevitable. It's convenient and, let's face it, delicious. So, you may as well know which menu options are best for you (or at least not the worst for you). BuzzFeed Health asked four registered dietitians to choose the healthiest options at a variety of fast food restaurants. They looked for items that had enough protein and fiber to promote satiety while keeping an eye on overall calories, as well as fat, sodium, and added sugar. Of course, dietary goals and needs vary from person to person. These items are general suggestions for healthier fast food ordering. "This classic is reasonable in calories, low in sugar, and reasonable in saturated fat," Langer explains. "You might think I'd choose the oatmeal, but let this serve as a warning: that healthy-sounding item has 33 grams of sugar." "I chose the egg and cheddar breakfast sandwich for its reasonable calories and sodium," Langer says. "I also really love the protein bistro box, because of its variety," Langer says. "This breakfast burrito has a good balance of carbs, fat, and protein and it's also a solid amount of calories, which should help you feel satiated for at least a couple of hours," Jones says. "The only downside is that this dish is loaded with sodium — containing 1,100 milligrams in just one serving. To put that into context, the American Heart Association recommends no more than 2,300 milligrams a day and an ideal limit of no more than 1,500 milligrams per day for most adults. If you're watching your salt intake, you’re better off skipping this one." "Even though it has 21 grams of sugar, some of that is naturally occurring in the milk and the fruit, and at least you get the benefit of fiber and antioxidants in the fruit," Langer says. "It's a source of protein, is reasonable in terms of calories, and is low(er) in saturated fat," Langer says. "I’d recommend the berry oatmeal over the maple," Giovinazzo says, "As much as I love maple, since I’m from New Hampshire, it’s really just sugar. So go for the berries to get more vitamins out of your breakfast choice." 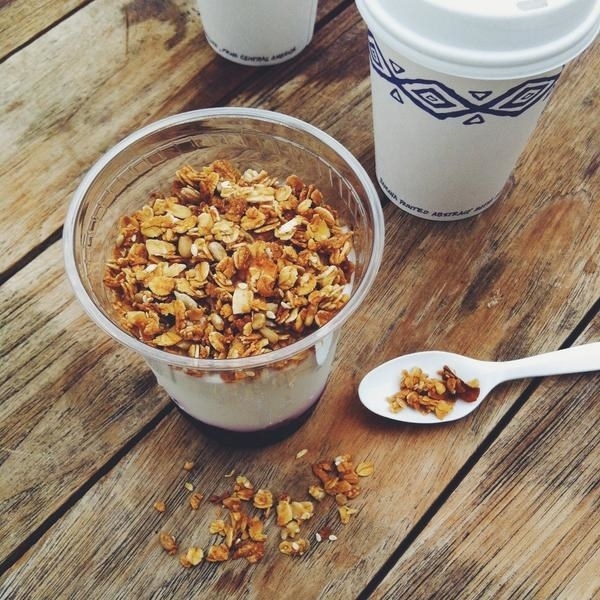 "My suggestion for healthiest on-the-go breakfast options would be the yogurt and berries parfait with a bowl of the berry oatmeal," Sit says. "When both options are combined, you get more protein, healthy fat, and a bit of fiber from the yogurt to work on your short-term hunger signals. The fiber in the oatmeal will also help with long-term hunger signals." "The egg and cheese croissan'wich is reasonable in calories, adequate in protein, and just the lesser of many, many evils," Langer tells BuzzFeed Health. "Most of the items are sky-high in saturated fat and sodium. 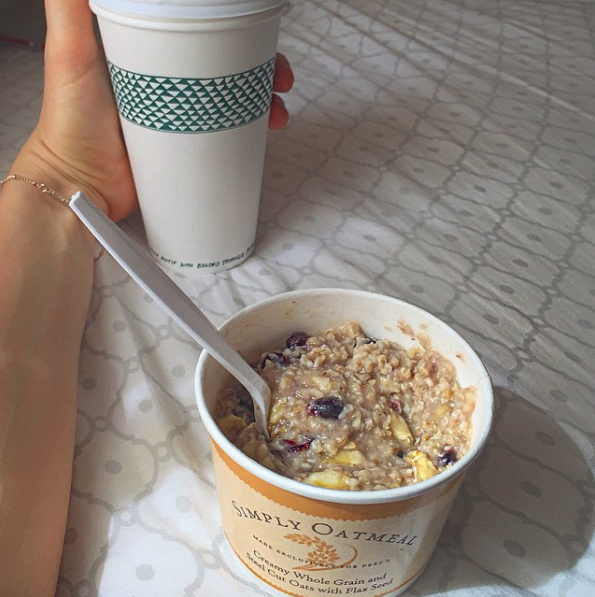 Yes, there's oatmeal, but it's low in protein and calories [which means it won't be very filling], and full of sugar." "Subway only offers a few breakfast choices, and with the exception of the sausage and cheese sandwich, the breakfast menu is pretty solid in terms of calories, saturated fat, protein, and sugar," Langer says. "The oatmeal isn't high enough in protein, but the southwestern hot wrap is amazing, if it's the one with whole eggs, not egg whites!" Langer says. "This breakfast sandwich includes an egg, which offers a healthy dose of protein, and avocado, which provides good fats that will help you stay satisfied for hours," Jones says. "It's also low in sugar and has five grams of fiber per serving." "This choice is okay in terms of calories, saturated fat, and sugar," Langer says. "This is calorie-, sodium-, and protein-appropriate," Langer says. "It isn't as loaded with sodium as the other options." "There were a few items on this menu I thought were decent choices, but my favorite was the egg white, cheddar, avocado sandwich on a skinny wheat bagel," says Jones. "You'll get a dose of protein, good fats, and energy-fueling carbs with this sandwich. The added bonus: nine grams of fiber per serving, which is 36% of your daily value." "Pretty much any of the skinny bagel options are good, except for the sausage options, which are too salty and too fatty," Langer says. "I chose this option because it included a balance of protein, carbs, and veggies," Jones says. "The protein in the eggs and fat in the avocado will help you stay satiated. This sandwich also includes a serving of veggies and contains a whopping seven grams of fiber, which is always a plus." "The Breakfast Jack is not excessive in calories and it has a good balance between carbs and protein," Jones says. "The only catch is that this breakfast item is pretty high in sodium, so try to minimize any processed food intake later in the day, especially if you are limiting your salt intake." "I would go with the egg white and turkey bacon sandwich," Sit says. "This is because the higher protein content, moderate fat level, fiber, and low carbohydrate content of this breakfast sandwich will do a better job of keeping me full in the short- and long-term, so I don’t end up overeating." "The blueberry almond oatmeal gives a little more variety than the classic, with the healthy blueberries," Giovinazzo says. "The tomato and quinoa quiche is a little high in saturated fat, so I’d watch how much saturated fat I had during the rest of the day," Giovinazzo says. "But otherwise, the eggs, some cheese, and quinoa make this a nice choice for breakfast." "I would get both the blueberry Greek yogurt parfait and the simply oatmeal as a combo because they're high in protein, modest in fiber, and low in fat," Sit says. "The Greek yogurt is great for both short-term and long-term hunger, while the oatmeal has fiber to also help ward off long-term hunger." "Any of the plain egg and cheddar, or egg and cheddar with ham, sub or flatbread options are fine," Langer says. "But if you get stuff on a biscuit, that will skyrocket both the calories and the sodium." "Of the menu items, the egg and cheddar grilled flatbread is probably your best choice," Jones says. "It's the lowest in sodium on the breakfast menu (though it's still technically high in sodium.) It also has a nice dose of protein at 15 grams per serving. The downside is the five grams of sugar (which I'm assuming is added) and the fiber content is minimal at one gram per serving."